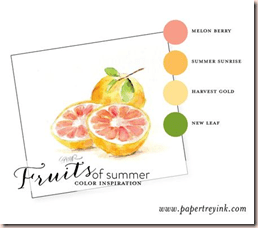 Welcome to another Papertrey Ink Blog Hop. 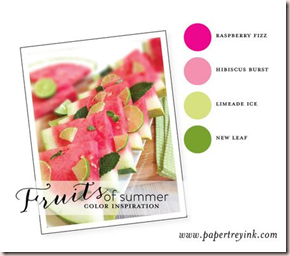 This month the focus was luscious, mouth-watering summer fruit colour combos. I was missing many of the colours of inks and papers used in the combos so this truly was a challenge for me! First I had planned on using this one and omitting the new leaf which I DO NOT like. The challenge did say we didn’t have to use every colour. I planned to make a 3-D, triple-scoop ice cream cone with dies and stamp some gorgeous berry sorbet and GOLD! swirls behind. Oh yeah! But I had NO harvest gold paper. Maybe the colour is too new to be in my multi pack I bought and rely on heavily? I’m still switching over from SU! to PTI as my main source of cardstock. I have no scraps either and don’t remember using any as card bases (the only way I’d not have any scraps) so I guess that must be it. I will have to write down my idea (I guess i just did, didn’t I? hee hee) and make it later! I usually get to the card right away, sorry! Here it is finally! The colour and inspiration photo is below. I don’t usually take a lot of inspiration from colour challenge photos but I was kind of stumped on a way to use these colours especially since I don’t have any raspberry fizz, limeade ice or new leaf ink. I hope you enjoyed my card! Please keep in touch by subscribing by email or adding my blog to your feed reader of choice. All the options are at the top of my sidebar. Enjoy the rest of the blog hop. 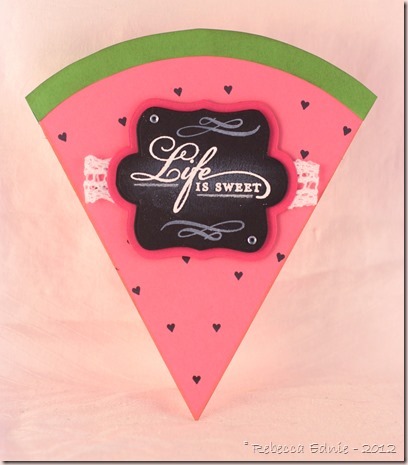 Really neat watermelon card. So clever to use the black hearts for seeds! Eeek, this is so pretty and adorable! Fabulously creative! Too cute! Little black hearts for seeds… Love! What a fun card! I love it. Sweet and clever, Rebecca. Even if you didn't have the colors you wanted to use, you pulled off a very special card!